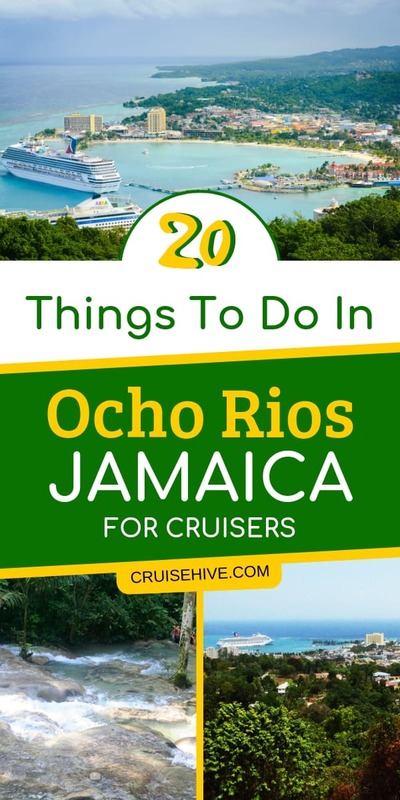 Find out about the best 20 things to do in Ocho Rios, Jamaica for cruise ship passengers. Covering popular shore excurions about the Caribbean destination. Ocho Rios, Jamaica was once a sleepy fishing village that was dramatically transformed into a high-end cruise destination. With the introduction of a cruise pier, this town grew in popularity and is now considered one of the top Caribbean destinations. Disclaimer: This post contains affiliate links which we could earn a commission from if any purchases are completed. The port which is located on the north coast of Jamaica is characterized by lush forests. The dense forest covers more than 3,000 acres of beautiful waterfalls, sparkling rivers, and verdant mountainsides and providing plenty of attractions for cruisers to enjoy. Otherwise called the land of eight rivers, the beautiful nature in this corner of Jamaica is just outstanding. Ocho Rios is also known for its entertainment history, being the resting place of Legendary Bob Marley and being home to two James Bonds movies. Fern Gully is a former riverbed whose river disappeared in a 1907 earthquake. Fern Gully was among the eight flowing rivers in the port of Ocho Rios before the 1907 earthquake. After the earthquake, the river vanished, and the riverbed was turned into a road. The once mighty river is now a remarkable three mile-paved-pathway that goes through a natural forest of ferns. The gully is known to have over 540 species of ferns. When driving through the ravine, you will come across beautiful ferns and many types of hardwood trees. It’s nice to drive through the gully as you breathe in the crisp and pure air. You’re going to need many of these cruise accessories before experiencing Ocho Riso. Located in the hills just a short distance from downtown Ocho Rios is Shaw Park Gardens and Waterfalls. A breathtaking, tranquil tropical garden. If you are a nature lover or garden enthusiast, this is an ideal place for you. The garden which has been nurtured for over eight decades is a paradise of exotic flora and beautiful cascading waterfalls. 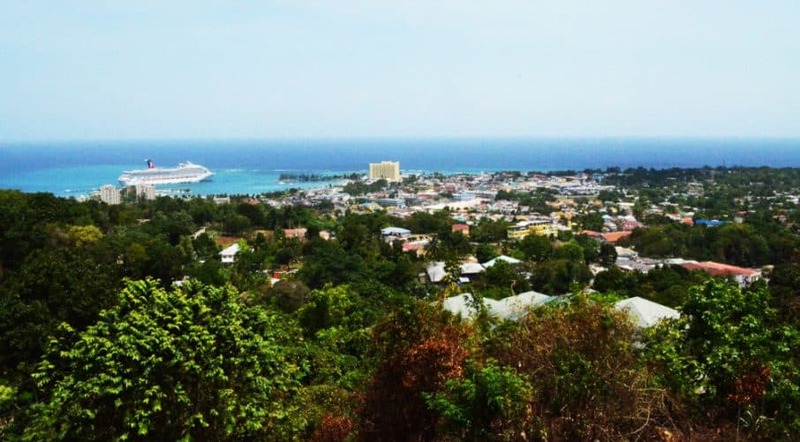 Escape the hot city and enjoy a nice breeze, explore beautiful flowers and trees and have unparalleled views of Ocho Rios beneath. Take advantage of the photo op in the place and snap away. Knock off one of the most popular bucket list items at Dolphin Cove, Ocho Rios. Set up in a 5acre piece of land with a natural cove. Go, swim, feed, pet, hold and play with the world’s most lovable sea creatures. An excursion to Dolphin Cove is one of the most popular things to do in Ocho Rios Jamaica. It’s a fun activity for everyone in the family or group. Other than hanging out with the dolphins sharing kisses, you can have an encounter with stingrays, learn about shark’s evolution, pet a rabbit or be appointed sea keeper of the day. Looking for something unique to do while in Ocho Rios? Then visiting Firefly is a must. Firefly is the home and final resting place of the famous Hollywood star Sir Noel Coward. Sir Noel built one bedroomed house at the top the hill, on Captain Morgan’s pirate lookout spot. Sir Noel then proceeded to live there and enjoy the remarkable lookout until his death. The house is now a museum that bears interesting history and features well-preserved photos of his days. You can tour the property and learn the history of Jamaica while enjoying the magnificent view of the Jamaican coast from the hilltop house. The little village of Nine Miles is a place for music fans, and it`s located in Saint Ann Parish. Nine mile is the birthplace and resting place for renowned reggae musician Bob Marley. There are guided tours in the small village who take visitors around the museum and the mausoleum where Bob Marley is buried. During the tour, cruisers get to hear and learn about the Rastafarian religion and also get to hear exciting stories of how the reggae icon lived his life. Please note the nine-mile tour is not for kids, a lot of Marijuana sold on it. Fun and adventure await you at the White River. 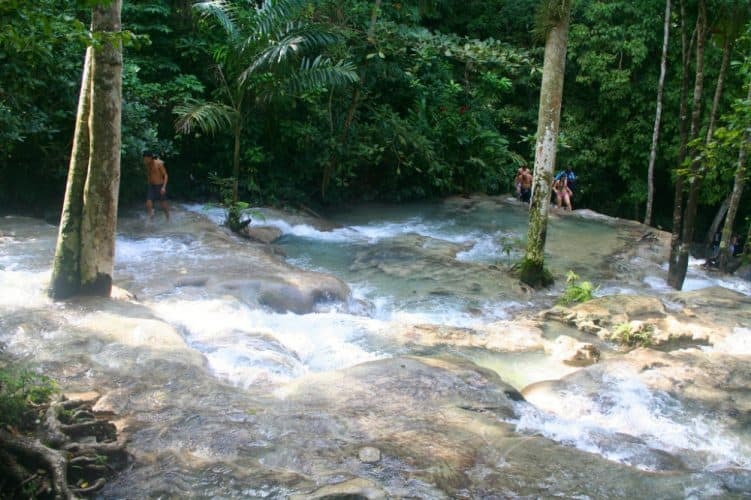 One way to enjoy Ocho Rios is to go river tubing on the White River. The wide freshwater river is popular for its crystal clear blue waters. A phenomenon that is thanks to the limestone bedrock that filters out impurities and gives the river its blue color. The tour starts with a long trip around winding roads on mountains where you get to see the raw Ocho Rios and how ordinary Jamaicans live. At the site, you get a safety briefing, a helmet, life jacket, and a tube. It’s best you wear water shoes and carry a waterproof camera. You need a waterproof pouch for an excursion like this. The ride is very enjoyable with stretches of rapids and stretches of calm waters. You will feel relaxed and rejuvenated on this adventure. Once you are through you can go for some delicious Jamaica Jerk. Dunn’s River Falls is arguably the most popular attraction in Ocho Rios. If you haven’t been there, it’s something you should consider. Dunn’s River Falls is a 55ft waterfall with terraces of cascading water along a 600-foot long spring. The falls are interspersed with pools on its entire length. Dunn’s is described by geologists as a living phenomenon as it continues to form terraces from sediments in its waters. Take a guided trip to the falls, where you will be made into a human chain to assist each other climb the falls. You must have water shoes for these type tours, find yours here. Ensure to wear water shoes as the limestone-based terraces are slippery. While you can climb the falls on your own, it’s best to do it with a guide as they know where to step and where not to step. This attraction will probably be the highlight of your trip and is a great place for the entire family or group. Blue Hole is a secret paradise located in the hills of Jamaica. This is where you go for thrill and adventure. There are a collection of waterfalls in this area with pools collecting beneath them; with the most popular being blue hole. This attraction is around a 20-minute ride from town. Jumping into the blue hole is an experience you won’t want to miss. There is a 20ft cascading waterfall where you can splash of the heat of the day. Rashguards are good to wear for these type tours, take a look at some here. Daredevils will have a blast jumping from scary heights while some will go for the Tarzan swings. All in all, you will have fun, and it might just be the highlight of your cruise. If you do not want to engage in activities such as river tubing, zip lining and going for horse rides, why don’t you relax on the beach instead? Bamboo Beach Club is one of the most beautiful beaches in Ocho Rios. It boasts of plenty of amenities such as bathrooms, beach chairs, food, drinks, and live entertainment. For something, you won’t soon forget, try bobsledding at Mystic Mountain. Jamaica has its own bobsled track and when in Ocho Rios you should try it. The bobsled track travels 3280 feet through numerous twists and turns as it cascades down Mystic Mountain. Slow riders and speedsters will enjoy this ride since the sled can be controlled using a hand brake. As a bonus, you can use the sky explorer to explore Jamaica’s exceptional rain forest canopy. Explore this seaside tropical rainforest from a different angle. Mystic Mountain which stands at 700 feet at its highest peak is located just five minutes from the cruise pier near Dunn’s falls. Go explore the highly forested mountain which offers interesting tour packages to experience its lush flora, sparkling rivers, and raucous bird life. Explore the canopy through a trio package containing a sky lift, a zip line, and the signature bobsled ride. Zip across the forest on the zip line course that range from 65-160 feet long and take in the breath-taking views as you fly across the white river area. You can also ride the sky explorer and get an excellent view of the forest canopy as it takes you 700ft above sea level. A unique way to explore the mountainous Ocho Rios is on horseback. Take a scenic horse ride that will take you through sugar factories and 100 year-old-castles. This ride will take you to the beach where you can enjoy riding the horse bear back in the water. You do not have to be experienced to go for these horse rides. All riders are welcome, and the guides take good care of you. The Green Grotto Caves are a 30 minutes’ drive from Ocho Rios. They are situated in Runaway Bay. These caves are Jamaica’s famous limestone caves. The caves were initially used by Arawak Indians, and they have a history of being used as a secret hideaway of slaves who had escaped and Spanish settlers who were fleeing from the British army. You can also recognize the Green Grotto Caves from various Bond movies. Guides will educate you about the history of the cave and show you humongous stalagmites and stalactites. You should be careful since there are snakes and bats inside the cave! River rafting on Martha Brae River is a must do. Get to experience a romantic ride on a handcrafted bamboo raft along Martha Brae River. Your tour guide will paddle you along the river as you enjoy and take in all the amazing sceneries. The guide will also give you important information about the lush rainforest you are passing through. Some of the things which you will see include jungle animals, and exotic foliage. You will also discover important locations where some of James Bond’s movies were shot. On your way, you can stop at some lovely points and do rope swings. When in Jamaica, you have to try the popular jerk chicken. While Margaritaville has an electric environment and is especially beloved by cruisers, try some local fare. Make a point of sampling local dishes at local restaurants such as Ms. T’s kitchen, Ocho Rios Jerk Center, Mongoose, and many others. Apart from jerk, you can try the local ackee and salt fish dish or the patties and oxtail soup. Expect tantalizing tastes from the dishes made with native Ocho Rios spices. Then have a cool refreshing cocktail or a red stripe. Island-inspired art is usually very interesting and thought-provoking. You can have a taste of Jamaica’s quality artwork at Harmony Hall. This art gallery has been there since the 19th century. This magnificent edifice is decorated with gingerbread fretwork that adds to its charm and allure. The hall is home to the islands most famous arts. Artists in Jamaica display their paintings, pieces of art, ceramics and sculptures here. Art lovers can purchase pieces of art that capture their eyes, at a fair price. You can also grab a tasty meal in the Italian restaurant downstairs. Mahogany Beach is a small tourist beach which is also popular with locals. Mahogany beach mostly comes to life during the weekends with loud music, football matches and smells of food cooking. There is a small shop at the beach for selling beach items. The beach is located about 1 km away from the town center, and you can use a taxi to get there. Find all the beach accessories you’ll ever need right here. Konoko Falls is a great place to relax and enjoy nature as you discover Jamaica’s historic past. Konoko falls is located in the hills of St Ann, and provides stunning views of Ocho Rios. If you wish to, parrots can be placed on your shoulder for a photo moment. At the bird enclosure, you are allowed to enter and feed the birds. The place was recently remodeled and is an excellent place for family outings. You can stay for about two hours here. For some gift shopping, you can visit the gift shop in the area. There is no better way of touring the undiscovered land of Jamaica than with an ATV. The ATV is simple to use and handle, and it will give you a beautiful view of the untouched land of this lovely Caribbean island. Explore the beautiful mountain terrain and traverse through the forests and local communities using the ATV. If you are a reggae fan, you should not miss this fantastic opportunity to ride on the famous Zion bus. During the ride, you will get to see the birthplace and resting place of Bob Marley and also get to learn about the Rastafarian culture. Enjoy your trip across the countryside as you are entertained with reggae music and the stories of Marley’s life. See you in Ocho Rios…. Your ship will dock at either Turtle Bay Pier or James Bond pier; luckily both are within walking distance of the town. The port area is sanitized and designed for cruiser’s comfort. Right near the pier are shopping areas such as Island Village, Taj Mahal, and Ocean Village Shopping center. More details on shore excursions from the cruise port. You can peruse through the crafts or duty-free shopping areas and get some interesting souvenir and gift pieces. There is also a small beach nearby that you can access at a reasonable entry fee. The best time to visit Ocho Rios as with all Jamaica is from November to January when the weather is nice and sunny. But beware it’s also the peak season and a bit pricey and crowded. That’s it, that’s all you need to know about Ocho Rios at least for now. We wish you an enjoyable trip. Happy cruising! Find out more about these best beaches in Puerto Rico not just for those on a cruise but anyone wanting to experience the 270 miles of beautiful coastlines. You should check these top 20 things to do in St. Croix, US Virgin Islands. Mainly catered for cruise ship visitors who are on a Caribbean cruise vacation. Find out about these things to do in St. John, USVI for cruise ship visitors who are on a vacation in the Caribbean which includes the U.S. Virgin Islands.